Another chapter in the memoir completed today. Another section to cut from an old manuscript that included, I guess you could call it “self-help” suggestions, suggestions I’m now not using. Now I’m just (just?) 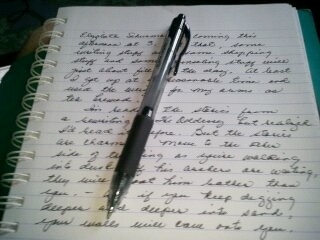 writing the story. 1, Take the joy from your solitude to heal whatever sadness in the world you can heal. 2. TRUST!…a shouted message hard to ignore. Okay! Got it! I could have decided the work too great, the command ridiculous, a successful outcome impossible when I heard the command to heal whatever sadness I could heal. I laughed. Long and hard. But ridiculous and absurd elicit two different responses. The command, indeed, seemed absurd, so I laughed; what else could I do? The work necessary; the need great. What’s come of those two commands, in the doing, is that following one feeds the other. When I teach clients or students to take a deep breath and tell themselves, “Trust, it’ll be okay,” they notice how their body relaxes and how fear or sadness lifts. Healing begins. Trust. It’ll be okay. Just keep walking. Your path is at your feet; you will not always feel this way. Trust your journey.Trust what you need to learn. To heal sadness in the world, the best person to begin with is you. At least, that was my journey. This memoir is the journey. Absolutely! You are absolutely right about forgiveness. Interesting…forgiveness is the basis of this memoir….The book opens with an experience of being told to forgive myself. Absolutely rocked me. Myself??? Of course, that’s what I had to do. Isn’t that weird….that forgiveness comes when we’re able to forgive ourselves. Thanks so much for bringing that back to the table. You’ve probably seen the photos of The Little House as I call it, out on the prairie where we go for a few days whenever we can. One night we went out and walked in the yard and there was total silence…no birds/beasts/coyotes/airplanes/tractor sounds. Nothing. When we stood still, there was only total silence. I don’t know if I’d ever experienced that before. Maybe as a kid out, but it always blows on the farm, always some wind, and that night, none. Husband and son are away at school. I’m home alone many days. I do treasure solitude. Thanks so much for writing. Yes, the forgiveness began with me forgiving myself. I was away for a quarter of seminary, too busy to process anything but studies. I began to realize that my dreams were slowly taking on a different feeling quality that lingered after I awoke. The healing process happened as grace. I trust (another of your points) that through my experience of the universe God is taking care of me. Enjoy your solitude. Interesting. A lot of my healing came through dreams too. Perfect! No tightrope walkers here, that’s for sure. Thanks so much for reading these memoir cuts. I post them because I like what they say, but the personal ruminations from what I know now don’t belong anymore in the what happened then story. Maybe I’ll get to do readings WITH workshops….now how’s that for a goal! Sound like an excellent idea to me. So how is it that with all the bells and whistles and magic things WordPress can do, we don’t have access to emoticons? I send you a smiley face! Okay, so how did you manage the emoticons? I see them on one of your comments. Lemme see here. If I 🙂 will it post as something other than a colon and parenthesis? Yes, I’ve was writing a little too long today and am verging on wonky. Did you get that? I’m not very good with directions. : – ) USE what I just typed but do not space and that will give you a smiley face. The word ‘trust’ has so many important meanings… Trust that all will be ok… Trust in others… Trust in our decisions… And trust in ourselves …this word really hit home with me tonight as I read your poignant post . You’re welcome! Glad it helped. I tell you, it took me years of practice to get that anchored, but once anchored, it doesn’t leave. And it saves sooooo many cranky nights! Hugs for you Chica. LOL… I mean really. Thank you. I guess a lot of my journeys have begun with “temporary insanity.” Might even go so far as to say it’s lingered….